The tracts are referred to as after the names of masses of grey matter joined by them. Their names normally contain 2 parts (or terms), the very first term indicates the origin and second the conclusion of the tract. As an example, a tract originating in cerebral cortex and ending in the spinal cord is named corticospinal tract. Likewise a tract originating in the spinal cord and ending in the thalamus is referred to as spinothalamic tract. The tracts are defined as collections of nerve fibres inside the central nervous system, which have same origin, course and conclusion. They may be occasionally known as fasciculi (= bundles) or lemnisci (= ribbons). The tracts of spinal cord are classified primarily into 2 types: descending and ascending. The descending tracts conduct the nerve impulses to the spinal cord from the brain. The lateral and anterior corticospinal tracts mediate voluntary motor actions. The pyramidal tract contains about 1 million fibres. Origin: The the majority of the fibres of corticospinal tracts originate from pyramidal cells (of Betz) of the motor area of the cerebral cortex. Some fibres originate from different parts of the cortex. Course: The fibres go through corona radiata, internal capsule, crus cerebri of cerebral peduncles, ventral part of the pons and pyramids of the medulla oblongata. In the lower part of the medulla bulk of fibres (about 75%) cross to the opposite side in the pyramidal decussation of the medulla and descend in the lateral white column of the spinal cord as the lateral corticospinal tract. The uncrossed fibres descend in the anterior white column of the spinal cord as the anterior corticospinal tract. The lateral corticospinal tract also includes some fibres, which originate from the ipsilateral cerebral cortex. The lateral corticospinal tract is located in the lateral white column in front of the posterior horn and medial to the posterior spinocerebellar tract. The anterior corticospinal tract is located in the anterior white column near the anterior median fissure. Lower down the fibres of anterior corticospinal tract also cross to the opposite side in the anterior white commissure of the spinal cord in the level of their conclusion. Conclusion: The majority of the fibres of both lateral and anterior corticospinal tracts terminate by synapsing with the interneurons, which in turn project to the motor neurons (a and y) of the anterior horn. Only 2% of the fibres synapse directly with the motor neurons. Due To decussation of corticospinal fibres in the medulla (medullary decussation), the cerebral cortex of a single side controls the muscles of the opposite half of the body. As the pyramidal tract traverses the brainstem, the corticobulbar fibres supply the motor nuclei of the cranial nerves. Therefore the pyramidal tract also consists of corticobulbar fibres. Effects of lesions of pyramidal tract: The lesions of pyramidal tract above the level of decussation, i.e., upper motor neuron (UMN) lesions result in the decline of voluntary movements in the opposite half of the body below the level of the lesion. The muscles aren’t really paralyzed but the control on the motor neuron supplying them, i.e., lower motor neurons (LMN) is lost. Consequently the tone of mus-cles is raised leading to spastic paralysis. 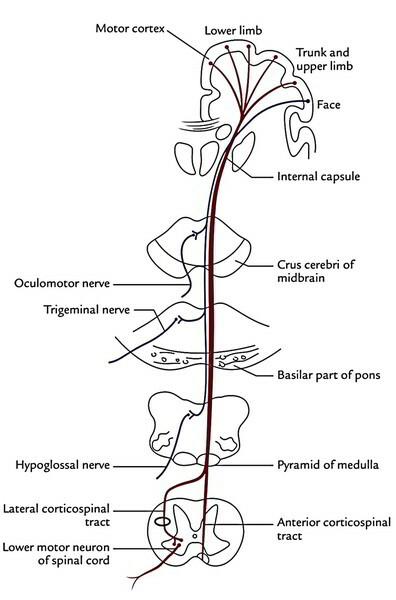 The fibres of the tract originate from the cells of the red nucleus (nucleus ruber) found in the midbrain and immediately caudal to reddish nucleus they decussate with those of the opposite side and descend as a streamlined bundle in the lateral white column of the spinal cord, ventral to the lateral corticospinal tract. The fibres of the tract end just like those of corticospinal tract in the anterior horn cells of the spinal cord. This tract creates a part of extrapyramidal system. Rubrospinal tract facilitates the process of the flexor muscles and inhibits the activity of the extensor antigravity muscles. This tract is located in the lateral white column. Its fibres originate from cells of the reticular formation in the brainstem (midbrain, pons and medulla) and relay in the anterior horn cells. This tract applies facilitatory influence on the motor neurons, which supply the skeletal muscles. It is located in the anterior white column. Its fibres originate from the cells of the reticular formation in the medulla and relay in the anterior horn cells of the spinal cord. This tract applies inhibitory influence on the motor neurons supplying the skeletal muscles. The reticulospinal fibres are now considered to be contained in descending autonomic fibres. The reticulospinal tracts so supply a pathway by which the hypothalamus can control the thoracolumbar sympathetic outflow and the sacral parasympathetic outflow. It projects from the hypothalamus and descends in the lateral white column of the spinal cord on the medial side of the lateral corticospinal tract and ends by synapsing with lateral horn cells of T1 to L2 spinal sections responsible for sympathetic outflow and lateral horn cells of S2, S3 and S4 spinal sections responsible for parasympathetic outflow. The ascending tracts conduct the nerve impulses from the periphery to the brain via the cord. Those concerned with pain and temperature sensations and coarse touch, example, lateral and anterior spinothalamic tracts. Those concerned with fine touch and conscious proprioceptive sensations, example, fasciculus gracilis and fasciculus cuneatus. Those concerned with unconscious proprioception and muscular coordination, example, anterior and posterior spinocerebellar tracts. The cell bodies of first-order sensory neurons (pseudounipolar neurons) of this tract is located in the dorsal root ganglia of the spinal nerves. The central processes of these cells goes into the cord via the lateral section of the dorsal root of the spinal nerves. In the cord, the fibres ascend 1 or two sections as the dorsolateral tract of Lissauer at the tip of posterior horns and after that relay in the posterior horn by synapsing with the cells of substantia gelatinosa. 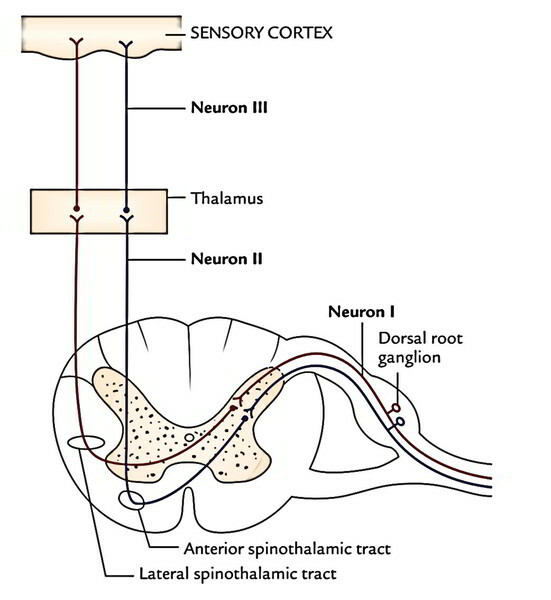 The axons of second-order sensory neurons of substantia gelatinosa cross to the opposite side in the anterior white commissure and ascend upward as lateral spinothalamic tract in the opposite lateral white column just lateral to the anterior horn. They terminate in the ventral posterolateral nucleus (VPL) of the thalamus. The sacral, lumbar, thoracic and cervical fibres are situated in layers in this tract from superficial to deep (somatotrophic organization). The axons of the third-order sensory neurons project to the primary sensory cortex of the cerebral hemisphere. The fibres of the tract carry pain and temperature sensations-the pain fibres being lateral to the temperature. The pain fibres become quite superficial in the lateral white column of the cord in the cervical region. For that reason cordotomy can be performed safely at this level to ease pain in the opposite half of the body. The engagement of decussating fibres of the tract in the anterior commissure in syringomyelia leads to bilateral loss of pain and temperature sensations below the level of the lesion. The cell bodies of the first-order sensory neurons of the tract is located in the dorsal root ganglia of the spinal nerves. The central processes of these cells (large and heavily myelinated) goes into the cord via the medial section of the dorsal roots of the spinal nerves and ascend in the cord 1 or 2 sections as the dorsolateral tract of Lissauer and relay in the substantia gelatinosa of the posterior horn. The axons of second-order sensory neurons of substantia gelatinosa cross the midline in the anterior white commissure and after that ascend as ventral spinothalamic tract in the opposite anterior white column just in front of the anterior horn. These fibres terminate in the ventral posterolateral nucleus of the thalamus. The lateral spinothalamic tract carries pain and temperature sensations on the other hand anterior spinothalamic tract carries sensations of coarse feel and pressure. The damage of anterior spinothalamic tract results in loss of light touch and pressure on the other side of the body below the level of the lesion. These 2 tracts inhabit the posterior white column of the cord, the tract of Goll being medial to the tract of Burdach. They carry sensations of conscious proprioception, 2 point tactile discrimination and shaking. The cell bodies of the first-order sensory neurons is located in the dorsal root ganglia of the spinal nerves. The central processes of these cells (thickly myelinated) goes into the cord via the medial section of the roots of spinal nerves and continue in the posterior white column as fasciculus gracilis and fasciculus cuneatus. Fibres from the coccygeal, sacral, lumbar and lower thoracic sections ascend upwards in the tract of Goll, while the fibres from the upper thoracic and cervical sections run in the tract of Burdach. The cervical, thoracic, lumbar and sacral fibres are arranged in that sequence from lateral to medial in these tracts. The fibres of fasciculus gracilis and fasciculus cuneatus terminate in nucleus gracilis and nucleus cuneatus, respectively. The axons of second-order sensory neurons from nucleus gracilis and nucleus cuneatus curve ventromedially around the central grey matter of the medulla as internal arcuate fibres to go through decussation. 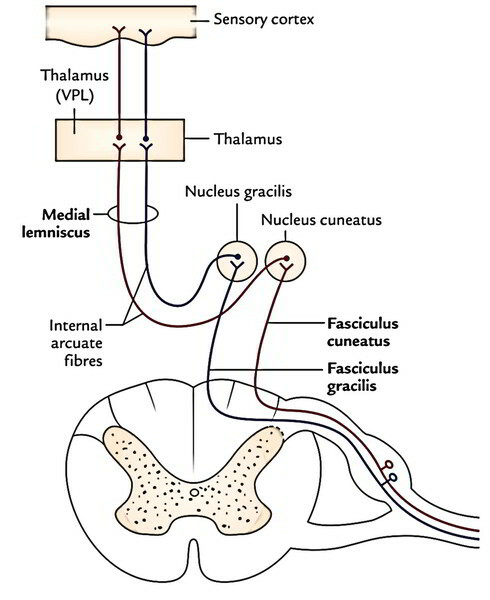 The fibres after crossing the midline turn upwards as a flat tract termed medial lemniscus, which courses upwards to terminate in the ventral posterolateral nucleus (VPL) of the thalamus. The third-order sensory neurons from thalamus project into the cerebral cortex of the cerebral hemisphere. This pathway carrying conscious proprioceptive sensations is named ‘dorsal column-medial lemniscus pathway’. The engagement of posterior white columns and posterior nerve roots in syphilitic degenerative disease termed tabes dorsalis results in loss of awareness of position. The patient is unable to identify the position or movements of his lower limbs unless he sees them. So, when he’s requested to stand up with his feet together and eyes closed, he staggers and falls as he can not keep his ideal position because of deficiency of proprioceptive info (Romberg’s signal). The spinocerebellar fibres can be found in the lateral white column of the cord and are split into 2 tracts: posterior spinocerebellar tract and anterior spinocerebellar tract. according to their location in the cord. They carry unconscious proprioceptive sensations from cord to the cerebellum and play an essential part in muscular coordination. The cell bodies of the first-order sensory neurons be located in the dorsal root ganglia of the spinal nerves. 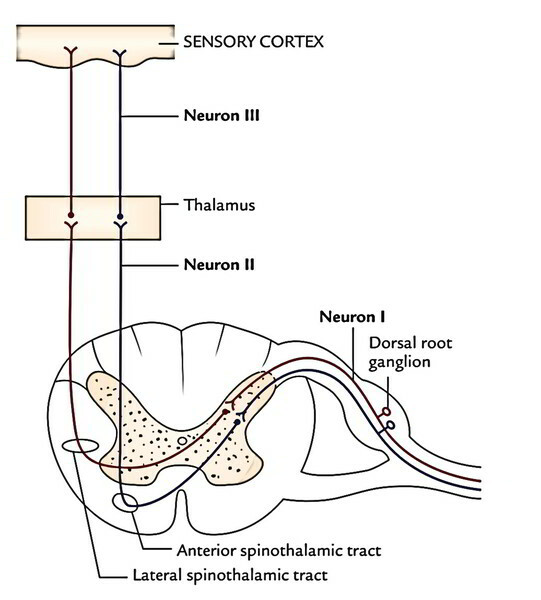 The central processes of these cells goes into the posterior horn of the grey matter via posterior roots of spinal nerves and relay in the nucleus dorsalis (Clarke’s column). The axons from cells of nucleus dorsalis (second-order sensory neurons) pass to the dorsolateral part of the white column on the exact same side and ascend as posterior spinocerebellar tract. The fibres of the tract goes into the cerebellum via the inferior cerebellar pedun-cle and terminate in the ipsilateral cerebellar cortex. The origin and course of the first-order sensory neurons is same as that of posterior spinocerebellar tract. The axons of cells of nucleus dorsalis (second-order sensory neurons) cross to the opposite side and pass to the anterolateral part of the lateral white column of the spinal cord and after that ascend to create the anterior spinocerebellar tract. 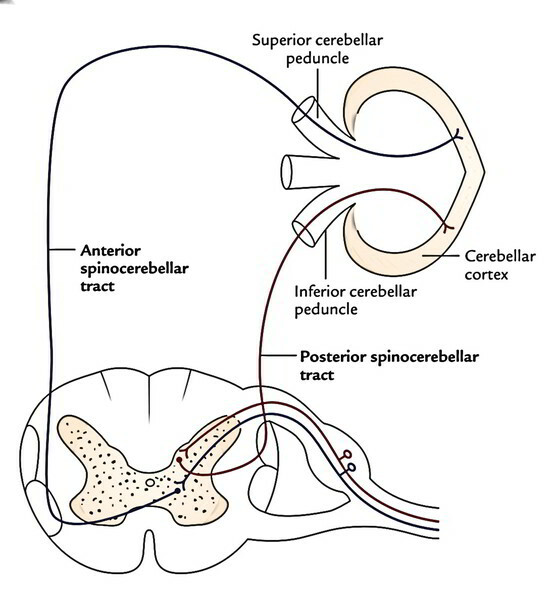 The fibres of anterior spinocerebellar tract goes into the cerebellum via superior cerebellar peduncle and terminate in the ipsilateral cerebellar cortex. The input signal of both posterior and anterior spinocerebellar tracts is ipsilateral. Functionally, both posterior and anterior spinocerebel-lar tracts carry nerve impulses from the lower limb. The posterior tract is concerned with fine movements, on the other hand anterior tract is concerned with gross movements of the limb as a whole. Bilateral reduction of position and vibratory perception. Spastic paraplegia with exaggerated tendon reflexes and favorable Babinski’s hint. In complete transection of spinal cord, there’s loss of movements and all sensations below the level of the injured section. In hemisection of spinal cord (Brown-Sequard syndrome), there’s ipsilateral spastic paralysis on account of lesion of corticospinal tract, contralateral loss of pain and temperature sensations and ipsilateral loss of conscious proprioception and perception of shaking because of lesions of lateral spinothalamic tract and dorsal column-medial lemniscus pathway respectively. To summarize, the motor nerve impulses travel from the brain to the anterior horn cells of spinal cord via the descending tracts and after that out to the periphery via the spinal nerves. The sensory nerve impulses from the periphery go via spinal nerves into the spinal cord via posterior or dorsal horn and after that up the spinal cord to the brain via ascending tracts.